in love with this stuff, got ya girl's face looking riiiight. ☺️ - thanks to @agostinamakeup for turning me on to @lemieuxcosmetics!!! People Stylewatch "I love Le Mieux Eye Cream, my eyes continue to look youthful, even when I am working 18 hours a day." 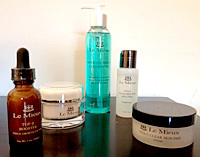 Le Mieux has become my favorite skincare routine, the line leaves my skin so refreshed with a clean and light finish. I love how the Le Mieux Exfoliating Cleansing Gel refreshes my skin and keeps my pores clear! And the Vita C Clear Skin Pads give my skin a beautiful healthy glow! Where would I be without my products! Thank you @LeMieuxSkincare! You take gooood care of me!!! 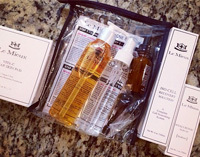 In hair & makeup at #DogWithABlog Just got my new goodies from @LeMieuxSkincare which I am most grateful for!